A study of the effects of air–sea interface, bubble and particulate scattering, and medium inhomogeneity on the underwater light field distribution, downwelling irradiance (Ed) was carried out theoretically using Monte Carlo numerical simulation technique. The downwelling irradiance was computed for different scenarios (with and without waves and bubble effects) and compared with the in situ measured values. The wave effect was included according to a model given by Cox and Munk and the effect of bubble was included by estimating the Bidirectional Transmittance Distribution Function (BTDF) of a bubble layer. Furthermore, the effect of the variation of particulate concentration along the vertically downward direction on downwelling irradiance was studied by stratifying the underwater medium, instead of considering homogeneous water column, for the calculation of Ed. 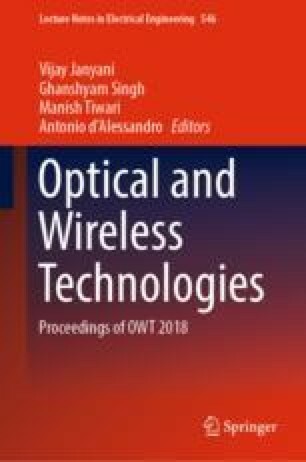 The findings showed the importance of considering the air–sea interface (wave and bubble) effects and stratification in estimating the underwater light field distribution and thereby the channel characteristics of an Underwater Wireless Optical Communication (UWOC) system. In particular, the present study can be helpful to researchers and engineers in modelling the effects of air–sea interface, bubble scattering and particulate scattering on the power budget, channel impulse response and signal-to-noise ratio (SNR) of a vertical communication link between aerial and underwater platforms.